Z French like to sspeak like thissss. In France, they call French fries - frites. Don't they know they are French fries? sheesh. Well, forget French fries. I am serious - FORGET French fries because they are just potatoes, deep fried, and dipped in salt. They should be served with a side of angioplasty. Also, French fries are a KETCHUP delivery device. Have you noticed how the salty, crunchy, soft fry works so well with the sweet tomatoey ketchup? Man, that is good! Since I am growing zucchini in my garden, I decided to try to make fries with them. I was worried they were a bit too soft to make a great fry - but it turns out that this recipe works well. I used corn meal to get a good crunch on the outside of the zucchini. You can eat an ENTIRE zucchini prepared this way for 161 calories - and you get 9 grams of protein, and over 4 grams of fiber. These are incredibly good for you and shouldn't even be compared to their evil cousin potato fries. Now, I am not going to tell you that these taste like French fries because they don't. Without deep frying and the like, we end up with a healthier tasting version of a fry - Z Fry. But, you still get a great ketchup delivery device and you won't need any heart surgery after you eat these. Everything is a trade-off. Check out Never Eat Fast Food French Fries Again for an even easier French fry substitute. How do you deal with French Fries? Heat oven to 425 F. Spray large rimmed baking sheet with non stick spray. Slice zucchinis in half and then again in half along the length. You should have 4 quarters. Slice quarters into 5 slim pieces. Put egg whites in a shallow bowl and beat with fork until a little froth appears. Mix bread crumbs, corn meal, salt, and oregano (optional) in a shallow bowl. Dip zucchini pieces into egg whites, and then into bread crumb mixture. Place on baking sheet and bake for 10 minutes. Flip and bake for 10 minutes longer. Serve with ketchup or marinara sauce. These can be made ahead and just eaten at room temperature. They are best out of the oven. Wow! I never knew zuicinni was high in protien. Never would have guessed. Thanks! @Chefprotoss - the egg whites add a significant amount of protein in this recipe - and the zucchini adds a little. These look glorious, can't wait to try them. I wonder what other veggie you could do this with, maybe eggplant? those look great! My friend made some this week, and she added a bit of grated parmesan to hers, mmm! I may make these, even tho I'm a vegetarian AND I don't like ketchup. I LOVE zucchini! These are really good and a wonderful way to use all that zucchini up. I like to oven "fry" food. I could never fry traditionally to my satisfaction, plus I dislike the greasiness of fried food. For those ketchup haters out there - just use marinara sauce (more gourmet and delicious). Does anyone know what a good substitute to egg whites would be for a vegan? I'm not the best cook (I bake instead) and don't know what can be substituted as a good holding agent for the bread crumb mix. using quinoa as part of the "crust" would really up the protein factor & provide a nice crunch! Cant wait to make these! Back from going to the store to get some of the stuff! Lets hope kiddos think they are just as good! Thanks for another GREAT recipe/idea!!!! Definitely going to try these! My Mom would do something similar but pan fry the round slices instead. This seems much easier/healthier. We never bothered with ketchup. Great all by themselves. @tea-bag: Would you cook the quinoa first or use it dry? Looks yummy. PS for "faux frying" it works better to use egg substitute over egg whites. It "sticks" better...whatever is used to make the consistency more eggy. These are fantastic.....try them with honey mustard. Yummmmmmmm! We do this with eggplant too with a bit of marinara for dipping. I have begun to use Zuc & Yellow squash as pasta--it is a million times more satisfying that spaghetti squash as a pasta substitute. simply mandolin or "potato peeler"ribbons of the squash- and either use them flat and broad or stack and cut small strips- no need to cook them as the hot sauce of your choice will wilt them just enough-- I promise this is so much better than you can imagine! Is there a way to print out your recipes without having to print the comments too? Thanks! I'm gonna try them with eggplants instead of zucchini, not really a fan of those :p Thanks for the GREAT recipe! Might double dip them (egg whites- crumbs - egg whites - crumbs) as well to amp up the crunch! and Shrimp and Steak filet medallions. It was delicious! The zuchinni and the rest of the evening as well. I will have to try your recipe for Zuchinni when I get home! Tried these the other day with my family... it was a huge hit! and super delicious! wonderful! i can't wait to try these! I'd love to try this, but am severely allergic to eggs. What egg substitute would you suggest? @Emmy - I think egg replacer would work because it is sticky. You need something that will stick the bread crumbs to the zucchini. Thanks for your question! Instead of ketchup or marinara, I used a mint, garlic, and cucumber yogurt.....sooooo gooood. Just chop mint, garlic, and cucumbers and mix with greek or non-fat plain yogurt. Really kicks the flavor it you mix in processor. If you like spice add a little hot peppers or cayanne. Fresh and light dip for chicken, veggies, but esp. breaded foods. These look delicious! Going to try them this weekend. I just wanted to say thank you for putting the WW Points Plus values on your recipes. I'm back on WW and "cooking" dinner is always a crap shoot on points. So THANK YOU! 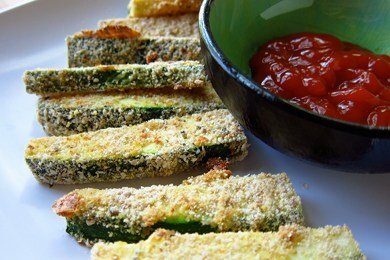 I 'discovered' zucchini fries this summer and have not had 1 zucchini go bad!! That is to say we love these fries!! The recipe I use calls for parmesan cheese instead of the corn meal. I've been making these daily - even our picky dad who lives with us loves them and he is not a veggie eater. Try them - you'll fall in love with something green!! Grandkids loved them too, but they are great veggie eaters anyway. These are awesome! You can also try Panko breadcrumbs - anything light breading makes these YUMMY! Sometimes I spread a thin layer of olive oil or coconut oil, with a paper towel. Last Summer my dad said, why would anyone want fries after they've had these!! That is SUCCESS. Our grandkids love them too! Another way Zucchini is yummy is add some soy sauce to a little olive oil and add minced garlic - marinate the zucchini in this mix in a plastic bag and then grill - oh my goodness!! I've done something similar with our zucchini and Z Fries beat regular fries - hands down!! Even my dad (87) loved them, so I guess you can 'teach an old dog new tricks'. Mighty tasty! I also added parmesan cheese. Did I say YUM !?!?! I've been making these for years, except I do add some grated parmesan on top at the end of the baking :) I normally use 'panko' as well, but think I'll try the wheat bread crumbs & cornmeal next time ! To each their own. Yes pommes frites or Fried Potatoes can be prepared in hot oil or baked in the oven. The same with Zuchinni, Carrots, Parsnips, Beets, oh and Sweet Potatoes are my favorite! I grew up with a vibrant garden to feed me. The one so have this year is going to have Luffa seeds and hopefully tomatoes and squash. Happy eating everyone! To the vegan eater... 2 of my gf’s sons are HIGHLY allergic to eggs. They use flaxseed as a substitute. Mix everything together, cover and refrigerate. You can use it immediately, but I think after everything sits for a bit, it tastes better.